Say hello to summer days in this crop top! This top can be tied in the front or back and features a deep v neckline. Effortless frills can dress up any outfit! Frill detailing around the neckline and arms! 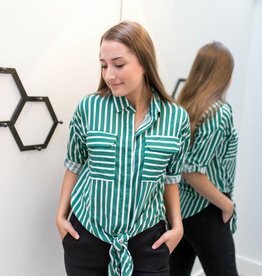 Model is 5’3 and wearing size small. The must have yellow for the season! Perfect mustard yellow sweater for spring! 3 button detailing up the sleeves. Long-sleeve floral blouse with fun open ruffled sleeves. Make a statement in this green blazer! Has shoulder pads and pockets on either side.